The Little Fire Ant (LFA) is a slow moving, brownish orange species about 1.5 mm long. The ant has a three jointed antennal club, two spines on the posterior dorsal portion of the thorax, and lacks teeth on its clypeus. Click here for a useful key discriminating the LFA from other ants occurring on Hawaii. The LFA is also known for a sting and bite disproportionally painful to its diminutive size. On the Hawaiian Islands, the LFA may be difficult to distinguish from two other ant species: Leptothorax sp. 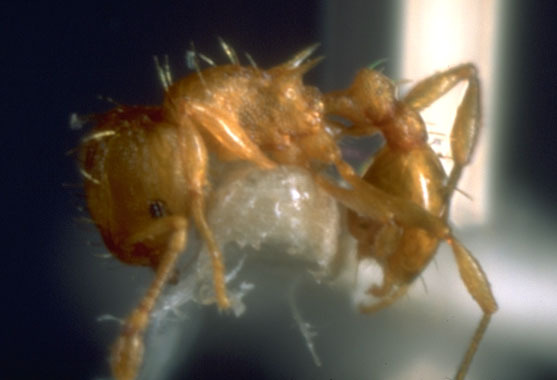 undet 1 and Tetramorium simillimum. The former shares a similar color and pair of epinotal spines with the LFA, but is slightly larger (about 2 mm). The latter is a common species of similar size and coloration to the LFA. However, unlike W. auropunctata, it moves very quickly while alive. Original Distribution: W. auropunctata is generally described as neotropical in origin; it is abundant in Central America and central and southern South America. Current Distribution: This species is now widespread. Its range includes the Continental U.S. (Texas and Florida), Hawaii, warmer portions of Mexico, Cuba, Guatemala, Honduras, Costa Rica, Panama, Trinidad, the Guyanas, Jamaica, Haiti, Dominican Republic, Puerto Rico, American Virgin Islands, Guadeloupe, Dominica, Martinique, St. Lucia, St. Vincent, Grenada, Barbados, Dutch Antillies, Brazil, Bolivia, Argentina, Uruguay, Colombia, West Indies, West Africa, Galapagos Islands, New Caledonia, Solomon Islands, and Vanuatu. 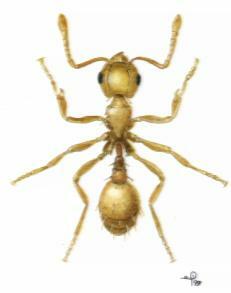 Little Fire Ant populations may also exist in California. Lope Reserve, central Gabon - exact date unknown, but between 1965 and 1984. California: The LFA has been intercepted in this state several times, but its status is unknown. A population may exist in Los Angeles county. Santa Cruz Island: exact date unknown, but possibly between 1910 and 1920. The first published record was in 1972 by Silberglied. The exact date of introduction is unknown, but between 1955 and 1972. Vanua Lava, Mota, and Gaua - December 1998. Modes of Introduction: This species is commonly associated with and distributed by humans; nurseries, fruit tree orchards, and ornamental plants are all potential habitat for the LFA. Since these ants have an affinity for nesting at tree bases and in potted plants, they are easily spread by plant nurseries. When LFA contaminated plants are purchased and planted, the ants may become locally established. In the case of the Lope Reserve (Africa), a local logger claims that ants were present in the packaging of food flown in from Booue and Libreville. The food was given to loggers working in the Reserve and the ants consequentially became established there. In other instances, the LFA has been purposefully introduced by humans. For example, LFAs were intentionally transported between cacao (Theobroma cacao) plantations in Cameroon to biologically control pest insects, particularly Miridae (Hemiptera). Reasons Why it has Become Established: W. auropunctata is impressive in its ability to flourish in regions where it did not evolve. However, it should be noted that a disproportionate number of these areas are islands or island analouges, such as Florida and California. According to the "vacant niche" theory, relatively species-poor communities (such as islands) are prone to invaders, who capitalize on the lack of predators or naive prey existing there. 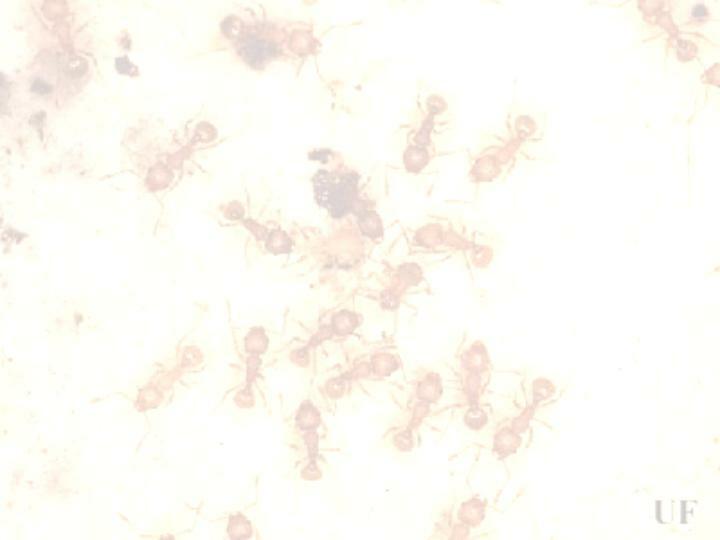 The LFA is a unicolonial species, spreading by inseminated queens accompanied on foot by workers. The ants are opportunistic nesters, requiring little shelter and intra-specific aggression has not been observed between neighboring groups. These dispersal characteristics result in high ant abundance within a small area and may help the ants compete with other arthropods for space. The LFA is a food generalist, foraging twenty-four hours a day. In one experiment, W. auropunctata was found to recruit more workers and forage longer at baits than other ants. LFA populations are easily supported by the resources available on Hawaii. Although slow-moving, the ants are highly aggressive in defending their territory. Once LFAs have invaded an area, they quickly outcompete local invertebrates. Ecological Role: W. auropunctata is an extremely competitive tramp ant species with generalist habitat and food requirements. In warm areas below 4,000 feet elevation, it can be found in clusters of a few dozen to a few hundred. It nests opportunistically in cracks and crevices, under rocks, potted plants, leaf litter, and stones, or on ornamental trees and foliage. LFAs are similarly flexible in their diet, consuming invertebrates and plant parts. W. auropunctata also feed on honeydew; the ants protect and tend plant-feeding insects as a source of this sugary substance. Where it is established, W. auropunctata generally decreases arthropod diversity; the ants both outcompete and prey on the local community. Predators of invertebrates, such as birds and lizards, may also be negatively impacted by decreased arthropod biomass due to a bottom-up effect. Benefit: Attempts have been made to employ the LFA as a measure of biological control for pest insects in Cameroon. Threats: Studies show W. auropunctata has decreased local arthropod biodiversity of regions in the Galapagos and the Solomon Islands. As time passes, these effects may be noticed in recently invaded areas such as Hawaii and Gabon as well. LFAs contribute to the success of agricultural pest insects (Homoptera) such as aphids, scales, and mealybugs and are a nuisance to plantation workers and horticulturists. LFAs are also known to contaminate food (especially fats and oils) and occupy beds, clothing, and furniture. Their presence in homes is undesirable due to their painful sting. In some people, stings are accompanied by large welts and extreme burning and itching phases for up to three days. Occasionally, cornea trauma has been reported in conjunction with Little Fire Ant stings on dogs, cats, and even elephants. Control Level Diagnosis: I recommend that the Little Fire Ant be actively controlled in Hawaii and other areas it has recently invaded. "Highest Priority" should be given as a control level to these sites. W. auropunctata is a highly invasive species with vast potential effects on local arthropod biodiversity as well as an agricultural menace. If established, production of goods will be diminished at two levels: decreased plant production (due to increased Homopteran abundance) and losses in harvest (due to decreased efficiency of plantation workers). It is much easier to eradicate the LFA from recently invaded sites than from areas where they are firmly established. To minimize future difficulties and expenses, a concerted effort must be made now to eliminate W. auropunctata from the Hawaiian Islands. Control Method: Various chemical treatments have been used to eradicate W. auropunctata populations. These include Amdro, Extinguish, and other IGRs, which were slated for use on LFA sites in Hawaii in 1999. Although successful in the past, Amdro is not approved for use on food crops; this limits its utility. In Florida, chlorinated hydrocarbons, organophosphates, and carbamates have been used as persistent pesticides to control populations of W. auropunctata. However, in some areas when pesticide applications were subsequently reduced, populations returned to high levels. For colonies living in and around buildings, residual insecticide should be used. If the colony occupies a a wall void or wood, injecting a dust or aerosal insecticide may be effective. In 1999, the Hawaiian Department of Agriculture Plant Industry Division proposed a multifaceted approach to LFA control. This included a 100% inspection policy on all plant material exported from the islands, required LFA-free plant nursery certification, and regular bait surveys to determine distribution of the Little Fire Ant. The Division also suggested testing of potted plant dip and spray treatments for effectiveness on all LFA life stages. Clark, D.B., Guayasamin, C., Pazmino, O., Donoso, C., and Paez de Villacis, Y. 1982. The Tramp Ant Wasmannia auropunctata: Autoecology and Effects on Ant Diversity and Distribution on Santa Cruz Island, Galapagos. Biotropica. 14(3):196-207. Fabres, G. and Brown, W.L. JR. 1978. The recent introduction of the pest ant Wasmannia auropunctata into New Caledonia. Journal of the Australian Entomological Society. 17:139-142. Fernald, H. 1947. The Little Fire Ant as a house pest. Journal of Economic Entomology. 40(3):428. Holldobler, B. and Wilson, E. 1990. The Ants. Belknap Press of Harvard University Press, Cambridge. Spencer, H. 1941. The small fire ant Wasmannia auropunctata in citrus groves - a preliminary report. The Florida Entomologist. 24(1):6-14. Wetterer, J.K., Walsh, P.D., and White, L.J.T. 1999. Wasmannia auropunctata (Roger) (Hymenoptera: Formicidae), a destructive tramp-ant, in wildlife refuges of Gabon. African Entomology. 7(2):292-294.